So here's the Skull Kid from Majora's Mask, another favorite Zelda game of mine. I'm proud of this carving because it came out just as good as I'd hoped, and it's purely carved--no shaved bits. Hello! 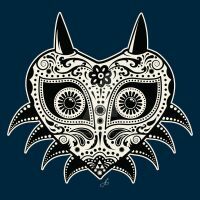 You've been featured in this Majora's Mask Artisan Crafts Feature. Happy Holidays! Thank you, I'm honored! ^__^ Happy Holidays!